SEAN: There’s a ton coming out that I’m interested in. Light Novel-wise, we have the 2nd Bakarina and the debut of Classroom of the Elite. And there’s the new Kino’s Journey manga. But yeah, there’s also a ridiculous amount of Viz. 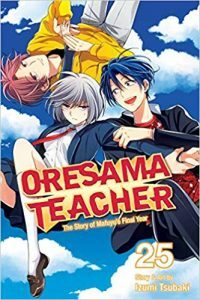 Including Oresama Teacher, which I still love to bits. It’s my pick. MICHELLE: There are lots and lots of shoujo releases that I’ll be eagerly devouring, but since volume seventeen of My Hero Academia will mark the first time I’m all caught up on the series, I’m going with that! ASH: It’s not manga, but I’m very excited for the chance to finally read the fourth and fifth Boogiepop novels, so the second omnibus in the series is my pick this week! MELINDA: I am a huge fan of the anime adaptation of Kino’s Journey and was devastated about the cancellation of the novel series way back when, so that has to be my pick this week. I don’t always love manga adaptations, but in this case, I can’t feel anything but excitement and so much hope. Maybe too much hope. Time will tell. ANNA: I have to go for the shoujo, but I can’t choose between Ao Haru Ride and Shortcake Cake because they are both so good! They are my picks of the week!